Properties in the Hunter Hills neighborhood are nestled along quiet, tree-lined streets. Real estate in this neighborhood tends to be much more affordable than it is elsewhere in Atlanta, which is a major draw to the area. The neighborhood is also positioned on a completed section of the Beltline trail, which makes for a wide variety of recreation opportunities. Most of the homes in Hunter Hills are small mid-century properties built between 1940 and 1969. While many of the residences are move in ready, others provide fixer upper opportunities to homeowners who want to get an even better deal on a place. 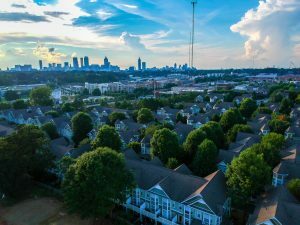 The average price of a home here is $107 per square foot, which is well below the median price in other Atlanta neighborhoods. It is easy to find houses under 100k in Hunter Hills, as the median closing price on a place is about $90,000. Rentals are also much cheaper in Hunter Hills than elsewhere in the city. Those moving to the neighborhood can expect to pay about $1,025 on rent, which is the current median rate in Hunter Hills. When considering a rental, potential residents should be aware that apartments are not found within the boundaries of Hunter Hills. Instead, it is much more common to rent a house in the neighborhood. Although housing is relatively cheap right now, the market in Hunter Hills is improving and prices are rising as a result. Now is a good time for homebuyers to settle in the neighborhood and take advantage of the low cost of living. Those who currently live in the neighborhood are generally lower income, making about $28,858 per year. Residents in Hunter Hills have a median age of 37, which makes them a bit older than the average age in Atlanta as a whole. Most of the people residing in Hunter Hills are single, but families have a strong presence as well. This is shown by the fact that 20 percent of the residents here are children. Whether getting to work or school, those who own homes in Hunter Hills have access to a variety of transportation options. About one quarter of the residents here use public transportation. The Metropolitan Atlanta Rapid Transit Authority (MARTA) has several bus lines that run through the neighborhood. Residents can also travel a short distance to reach three commuter rail stops. The West Lake, Ashby and Bankhead transit stations are all located less than one mile from the Hunter Hills neighborhood. At these stations, commuters can hop on the Blue or Green rail lines. Although Hunter Hills is well-connected to public transportation options, it is still a car-dependent neighborhood when it comes to running errands. The community has a walk score of just 36 points out of 100, but that is not to say residents don’t enjoy walking outside. The neighborhood’s proximity to parks and trails makes it a great place to live for recreational activities. When out and about, those who own homes here should be aware of the local crime rates. Crimes are somewhat more common in Hunter Hills compared to national averages. However, it is necessary to be cautious in any neighborhood regardless of its crime rates. Residents can stay safe by being aware of their surroundings and using home security systems, as is recommended in any large city such as Atlanta. The Lionel Hampton Trail, which runs through the southern portion of the neighborhood, connecting it to two different parks. Access to the Beltline, an expansive trail route that skirts along Hunter Hills on the eastern border of the neighborhood. The Washington Park Tennis Center, which has several courts that community members can play on. The Washington Park Natatorium, which has green space, picnic areas and a great aquatic center that all ages enjoy. Jus D’s Wings, which serves up wings and other casual comfort food at great prices.